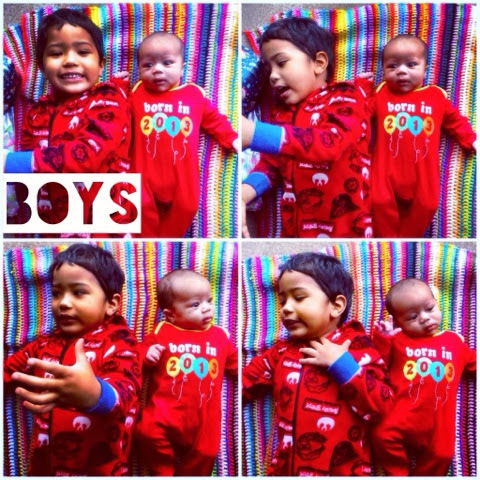 Little Life of L: Becoming a brother. When our family grew, not only did we become parents for a second time but our big boy become a brother. M may be little still but he really understands this concept. Once we had the 12 weeks scan and knew all was ok we made a determined effort to include M. We told him a baby was in my tummy and he would be a big brother. He came to scan appointments with me, doctors appointments, midwife appointments. He would talk enthusiastically about his little brother in my tummy. Tell people he was called Fred and mummy was having a baby. We included him in the sorting of clothes, or the packing of bags. He would look through the Argos catalogue and pick things he wanted to buy for his baby brother. Since the birth of our new one watching the dynamic of our family change has been lovely to watch. I brim with pride when I hear M say "I love my brother mummy" or he proudly introduces him to visitors. 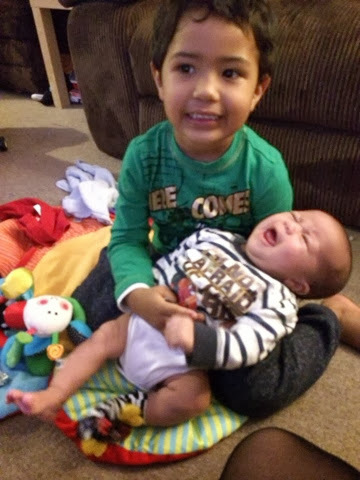 When he insists on saying morning to his brother and giving his brother kisses. We have had a few instances where M does not understand why he must wait for something. (He's an impatient sort!) but generally he has adjusted to this new person in the house well. I'm sure this will all change when this little person is running round after his big brother and stealing his toys!! But right now it's lovely to watch. M is (mostly!) so loving towards N. When he's crying he is concerned and starts singing to him. When we are in the car he tells me he is checking on his brother. When I'm changing his bum he wants to help. When he is in the bath he wants to wash him. When he's sitting on my lap he wants to cuddle him. I'm so looking forward to seeing how their relationship develops. There will be tears and tantrums and complainants and arguments. But I hope there will also be laughter and love and caring and joy. Im sure there will be fights and mischievousness and pranks and silliness. But I hope there will also be encouragement and protection and loyalty and friendship. It must be a difficult thing to understand as an almost 4 year old. That your parents now have someone else to provide for, care for and be there for. That you no longer have their complete devoted attention at all times. However this has been taken in his stride. He talks about his family (and includes N in that) he talks about his brother getting older and playing with him. He is just happy spending time with him. This was inspired by the new Johnson's advert #lifeisreborn http://www.youtube.com/watch?v=lcgkNM2rlXQ- bringing a baby into this world (wether first second or more) changes life not only for the mum, who for 9 months carried that bundle. But it effects all the family network. The grandparents, the aunties and uncles, and the father. It's been a busy past few weeks in my family with my sister giving birth younger first child. Seeing M with his baby cousin has been just as lovely. Plus I'm very happy to be an auntie too! !